Today, 1 August 2018, marks the 10th Anniversary of the entry into force of the Convention on Cluster Munitions. To date 120 states have committed to the goals of the Convention, of which 103 have become full States Parties and 17 are signatories. As the most heavily bombed country in the world per capita, Lao PDR was the second country to sign the Convention in Oslo in 2008 following host country, Norway. Over two million tonnes of bombs were dropped on Lao PDR between 1964-1975, equal to a planeload of bombs every 8 minutes, 24-hours a day, for 9 years. – Promote universal adherence to the Convention. The map above shows the countries which are signatory parties. A framework for cooperation and assistance that ensures adequate provision of care and rehabilitation to survivors and their communities, clearance of contaminated areas, risk education, and destruction of stockpiles. On 30 May 2008, the final draft of the Convention on Cluster Munitions was adopted by 107 States in Dublin, Ireland. 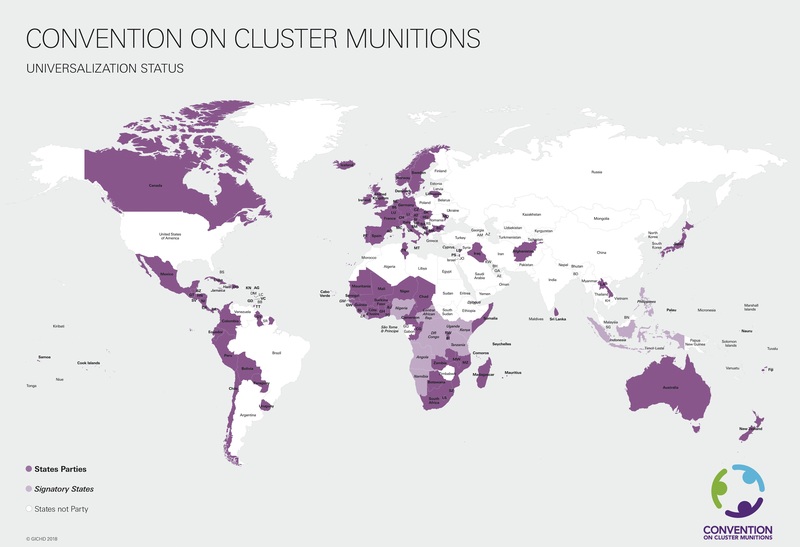 The support for the Convention was considered to be far-reaching, as 7 out of 14 States that had used cluster munitions and 17 out of 34 States that had produced them were amongst the States that adopted the treaty. As stipulated in Article 15 of the Convention, it was opened for signature in Oslo, Norway, on 3 December 2008, and was signed by 94 States by the end of the ceremony in Oslo. To date, a total of 120 States have joined the Convention, as 103 States Parties and 17 Signatories. Click here for the latest universalization status map and list of States by region. More workshops and meetings have been hosted by Coordinators on International Cooperation and Assistance in 2017 and 2018 to facilitate communication and foster partnerships between donor and States that have requested assistance. In 2017, the German Presidency of the 7MSP introduced the country coalitions concept to the Convention as a means to enhance international cooperation, which has already led to the formation of few partnerships. An example of a country coalition under the CCM is the Mine Action Forum in Lebanon, where engagement between stakeholders in Lebanon and donors (led by Norway) would be conducted in a predictable manner with a long-term commitment to clear Lebanon of cluster munitions and landmines. Reporting rates have been notably steady since States Parties began reporting, averaging 70% compliance each year. However, increasing the reporting rate and quality remains a priority under the Convention. The number of States Parties that have reported through their Article 7 reports to have enacted specific implementation law or that their existing law is deemed sufficient has been steadily increasing over the years. In 2011, only 11 States Parties had specific implementation law, and this has increased to 28 in the present day. 8 States Parties had reported to have sufficient existing law in 2011, and this has arisen to 23. In addition to that 17 States Parties currently have legislation under consideration or in the process of being adopted. Nevertheless, 34 States Parties still need to report or clarify if they have introduced national legislation that is specific to the Convention.